There aren’t too many souffles that focus on vanilla as a flavor. Chocolate, double chocolate, citrus and all kinds of other fruits seem to work themselves in easily. I’m not complaining because I really enjoy a good chocolate souffle, but sometimes I just want that vanilla to stand out more. These Ricotta Souffles are a perfect vehicle for vanilla because, like cream cheese in a cheesecake, mild ricotta cheese has a subtle flavor that adds richness and structure to the souffle while letting the vanilla be a focal flavor. This recipe is based on one I clipped out of an issue of Food & Wine magazine a couple of years ago (I was able to find it online, too!) for a lemon-flavored version. I eliminated the lemon, loaded up on vanilla and kept the technique the same. This souffle starts out with a choux pastry dough, made by cooking butter, water and flour together in a skillet. Ricotta, egg yolks and vanilla are added to this base, then beaten egg whites are folded in before dividing the mixture into ramekins for baking. The choux dough, which is the same type of pastry used to make cream puffs and eclairs, ensures that the top of this souffle becomes wonderfully crisp when it is fresh out of the oven. The finished souffles will fall fairly quickly, but that doesn’t take away from their deliciousness. They have a crisp top, moist and cheesecake-like interior, but with a very tender texture thanks to all that ricotta cheese. 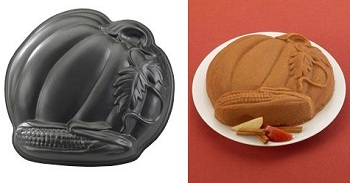 Even the leftovers – which can be stored in the refrigerator – taste good. You can definitely taste the vanilla in the souffles, too. Since they’re relatively plain (but delicious on their own), they are perfect for pairing up with a fruit garnish. I used freshly whipped cream and some blackberries, simmered lightly in a bit of sugar to sweeten them up. Preheat oven to 400F. Butter six 8-oz ramekins well and coat the insides with granulated sugar. Add the flour all at once, stirring vigorously with a wooden spoon until dough comes together in a ball. Continue to cook, stirring continuously, for one additional minute. Transfer dough to mixer or clean bowl and let mix at a low speed for 2-3 minutes until slightly cooled. Beat eggs in egg yolks one at a time, waiting until each yolk has been fully incorporated to add the next one. Increase mixer speed to medium-high for 1 minute to ensure that batter is very smooth. Then, blend in vanilla, milk and ricotta cheese. In a separate large mixing bowl, beat the egg whites until slightly foamy at medium speed. Increase speed to high and continue to beat eggs while gradually adding in the sugar. Beat until egg whites reach stiff, glossy peaks and all of the sugar has been incorporated. Working in 3 or 4 additions, gradually fold the egg whites into the ricotta mixture, folding gently until no streaks of egg whites remain visible. Divide batter into prepared ramekins. Level the tops with the back of a knife, and run your fingertip around the inside lip of the ramekin (this helps give it a cleaner rise). If you have extra batter (larger egg whites might lead to extra batter), feel free to fill an extra ramekin. 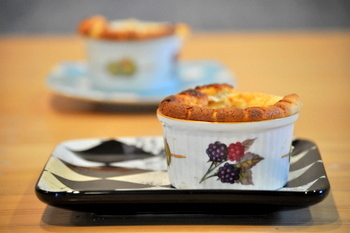 Place souffles onto a baking sheet. Bake for 30 minutes, or until souffles are golden brown and set. Serve immediately, plain or with whipped cream and blackberries. Whip cream to soft peaks in a large mixing bowl. Beat in confectioners’ sugar and vanilla extract. In a medium saucepan, combine blackberries, sugar and water. Cook over medium heat until sugar has dissolved, blackberries are softened, and some of the juice has been released. 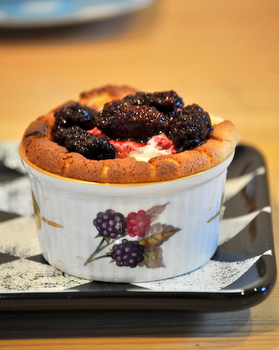 Top souffles with dollops of whipped cream and spoonfuls of blackberries. These look so elegant and sound fabulous. I love the ramekins too! the technique for this souffle is really different. ricotta sounds delicious in one! yum! This look wonderful and I can’t wait to try it out. Mmmm, ricotta. I have a question, in the ingredients you list 1 cup of sugar but not how it’s divided because in the recipe sugar is used twice. How much sugar goes into the egg whites and how much into the choux dough? Ema – The sugar isn’t divided because all of it goes into the beaten egg whites. It was a little bit of a typo to put it twice – thanks for catching it! As I type this, the souffle is in the oven. I decided to make one big one, so I think I’ll add at least 15 more minutes to cooking time. However, once the ricotta, eggs, milk, vanilla, butter, water and egg yolks are all mixed, it’s quite the thick batter. I almost switched from beaters to dough hooks since it’s too damned thick. I didn’t use a bowl because it was dirty and I was feeling lazy so I used a pot to beat the whites. Needless to say, they were nice and glossy but peakless. Since the batter was too thick, I just poured my peakless whites and decided to aerate the mixture in my stand mixer. I will tell you this, I licked the beater (what? It’s one of the perks of being the cook!) and it was wonderful but not too vanilla-y. It was GREAT. I hope after it’s cooked, the vanilla pops out even better.